This is an easy decoration for Christmas. Using some empty toilet rolls and tissue paper, create a recycled christmas tree with the kids and place on the wall or on doors to bring a christmassy feeling to the house. Cover cardboard with wrapping paper. Place toilet rolls over wrapped cardboard, making a christmas tree pattern. Using pen, trace a circle around all the toilet rolls. Cut the tissue papers into rectangles. You need 21 green and 4 yellow/brown. Cover toilet rolls with tissue paper on one side, using elastic band to hold. Glue all toilet rolls on the cardboard, using the marked circles as guide, and leave to dry. Glue your star on top of the christmas tree and your christmas tree is ready. Place on the wall or on the door. 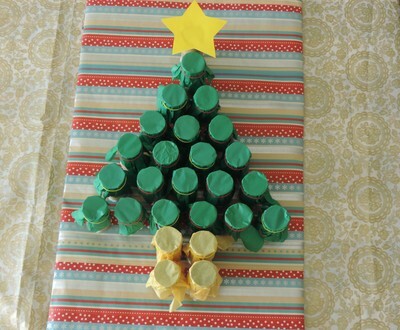 If you do not have any toilet rolls on hand, check out my last year's Christmas tree paper craft.